Regular Toaster Ovens vs Convection Ovens – What to Choose? You’ve probably noticed that I talk about convection cooking – A LOT. This is because I happen to love this technology, it makes life in the kitchen so much easier and if used correctly you get great results with the food you cook. If you have navigated straight to this page, you may be interested in knowing how convection works, and it’s really not that difficult to understand. Well, it would be if I went into all the technicalities but that’s not what this page on my website is all about. In simple terms a convection oven works by making use of a fan that forces the hot air around the inside and this is what helps to produce evenly cooked food. It also helps to keep the temperature even so you don’t get any “cold spots”. 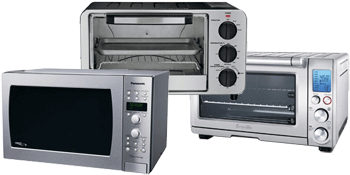 So now you know about convection, let’s take a closer look at regular toaster and convection ovens. These come in a wide range. You can have them as a fixed appliance in your kitchen or you can have portable types that sit on your countertop, and compared to a radial or thermal oven, they’re actually very efficient. They heat up much quicker and when the correct temperature has been reached, an oven like this will rarely lose the heat when you open the door. Of course, you can cook just about anything you like in a convection oven and because of the technology behind it, it’s possible to brown, crisp and even seal meats so you get a “juicier result”. So basically if you like the idea of a toaster oven yet you’d like to use it for more than just the odd piece of toast, you should look for an oven with convection. However for smaller cooking jobs in the kitchen, it might not be convenient both for energy consumption and time to head for your main oven. This is where toaster ovens can be very useful. Take this scenario (and it’s happened to me many times). Your alarm doesn’t go off and you’re late for work but you can’t leave the house without a tasty piece of toast or a warm bagel inside you. If you have a toaster oven, doing little jobs like this are quick and easy. This is because there are heating elements at the top and the bottom of the inside so you’re toast is “cooked” on both sides at the same-time. The most basic models of toaster oven are also very useful if you just want to warm some leftovers, heat up a pizza or some other type of pre-made snack. Of course you can also have a toaster oven that will complete all sorts of other tasks around the kitchen that don’t necessarily need to be done in the main oven. For instance, you can buy models that will bake and broil so you can prepare those tasty cup-cakes or grill a piece of fish in no time at all. There is plenty of choice on the market for this type of oven, and if you are thinking about purchasing one, or just want to find out more about a model you’re interested in, feel free to take a look at my toaster oven review page (which you can find here). And if you’re interested in the more advanced possibilities of convection, make sure you check out the convection ovens I have reviewed for you here.